Smokers who are able to quit might actually be hard-wired for success, according to a study from Duke Medicine. The study, published in Neuropsychopharmacology, showed greater connectivity among certain brain regions in people who successfully quit smoking compared to those who tried and failed. The researchers analyzed MRI scans of 85 people taken one month before they attempted to quit. All participants stopped smoking and the researchers tracked their progress for 10 weeks. Forty-one participants relapsed. Looking back at the brain scans of the 44 smokers who quit successfully, the researchers found they had something in common before they stopped smoking—better synchrony (coordinated activity) between the insula, home to urges and cravings, and the somatosensory cortex, a part of the brain that is central to our sense of touch and motor control. 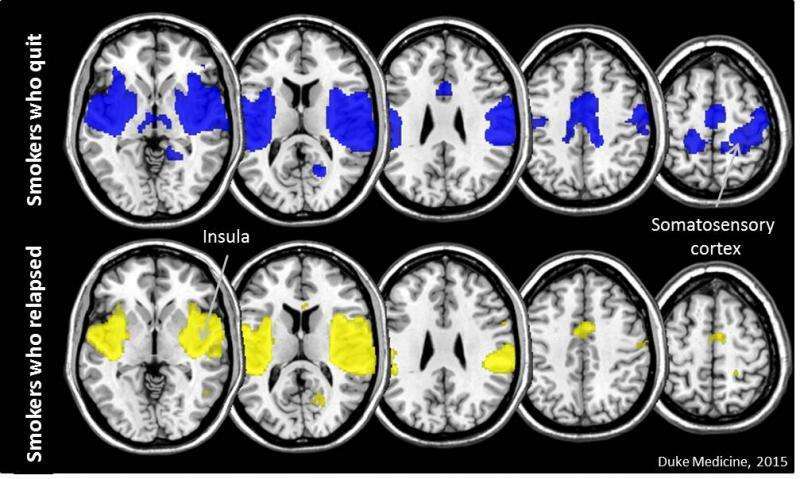 "Simply put, the insula is sending messages to other parts of the brain that then make the decision to pick up a cigarette or not," said Merideth Addicott, Ph.D., assistant professor at Duke and lead author of the study. The insula, a large region in the cerebral cortex, has been the subject of many smoking cessation studies that show this area of the brain is active when smokers are craving cigarettes, said Joseph McClernon, Ph.D., associate professor at Duke and the study's senior author. Other studies have found that smokers who suffer damage to the insula appear to spontaneously lose interest in smoking. "There's a general agreement in the field that the insula is a key structure with respect to smoking and that we need to develop cessation interventions that specifically modulate insula function," McClernon said. "But in what ways do we modulate it, and in whom? Our data provides some evidence on both of those fronts, and suggests that targeting connectivity between insula and somatosensory cortex could be a good strategy." Neurofeedback and transcranial magnetic stimulation, used to improve depression, are two treatments that modulate brain activity. With the findings in this study, researchers now have more information on where to further investigate, McClernon said. "We have provided a blueprint," McClernon said. "If we can increase connectivity in smokers to look more like those who quit successfully, that would be a place to start. We also need more research to understand what it is exactly about greater connectivity between these regions that increases the odds of success."